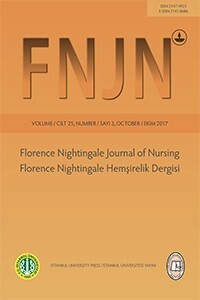 Florence Nightingale Hemşirelik Dergisi – Florence Nightingale Journal of Nursing is an open acess, peer-reviewed, scholarly journal published three times a year in February, June and October. It is a publication of Istanbul University, FLorence Nightingale Faculty of Nursing. The manuscripts submitted for publication in the journal must be scientific and original work in Turkish or English. The journal welcomes articles focusing on nursing research, practice, education and management issues. It publishes original scholarly papers that contribute to the development of nursing in all aspects, and broaden understanding and perspective regarding the field at both national and international level. It aims to provide an international platform for exchange of knowledge, research findings, practice and experience. The target group of the journal consists of nurses, academicians, clinical researchers, medical/health professionals, students, nursing professionals and related professional and academic bodies and institutions. The content of the journal comprise of research, meta analysis, systematic review, case report, review articles and letters to the editor. The subjects covered in the manuscripts should be in accordance with the scope of the journal. Only those manuscripts approved by its every individual author and that were not published before in or sent to another journal, are accepted for evaluation. The manuscripts evaluated and approved by the Editorial Board are published in the journal. The copyright of the published articles and pictures belong to the journal. American Psychological Association (APA) reference style should be used in the manuscripts submitted to the journal. Authors should ensure that citations in the text and reference list follow the APA style. Is There an Effect of Dietary Fructose on Development and Prognosis of Chronic Diseases?